Signed as a teenager in the early fifties, Rhondda-born Baker developed in the Plymouth & District, Devon Wednesday and Football Combination Leagues. His big break came on Christmas Day 1957 at Newport County, when his inclusion brought together the successful forward line of Anderson, Carter, Baker, Gauld and Penk. Originally a winger, Baker was converted into a deep-lying centre-forward, a role pioneered by the great Hungarian side of the mid-fifties. Never a prolific scorer, he had an important role appreciated more by colleagues than supporters. His career highlight came on 23 April 1958 at Wrexham when Wales under-23s beat an England side spearheaded by Brian Clough and Jimmy Greaves. Bothered by a knee injury, he played only twice more for Argyle after the 58-59 promotion. In 1961 he moved to Shrewsbury under player-manager Arthur Rowley. He was in the Town side against Walsall when Rowley broke Dixie Dean's record for Football League goals. After leaving Gay Meadow he eventually returned to South Wales, playing for Barry Town. 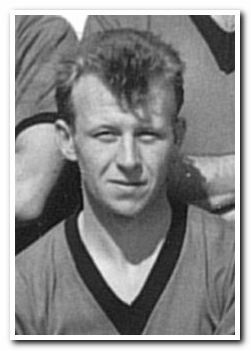 The Welsh World Cup squad for the 1958 tournament in Sweden included "Number 22 George Baker (Plymouth Argyle)". When I met George 50 years later, one of the first questions I asked him was what it had been like to be in Sweden, rubbing shoulders with some of the greatest players the planet had ever seen. His answer astounded me. "I never went" he told me. "Four of the Welsh FA officials decided to take their wives. That meant there were not enough seats on the plane and me and three others were left at home. We were told to stay fit in case we were needed, but the call never came." Imagine that happening today? The Press would have a field day.